Des Moines, Iowa (CNN) - Texas Rep. Ron Paul has distanced himself from a series of controversial newsletters from the 1980s and 1990s that bore his name and included inflammatory and racially charged language. As the newsletters burst into view, first during his 2008 presidential bid and again in recent weeks after he climbed to the front of the Republican race in Iowa, Paul has blamed the writings on ghostwriters. He said he was not aware of the "bad stuff," as he described it. But one of Paul's own books, published solely under his name, contains several passages that could be problematic as he attempts to push his libertarian message into the political mainstream. In his 1987 manifesto "Freedom Under Siege: The U.S. Constitution after 200-Plus Years," Paul wrote that AIDS patients were victims of their own lifestyle, questioned the rights of minorities and argued that people who are sexually harassed at work should quit their jobs. The slim, 157-page volume was published ahead of Paul's 1988 Libertarian Party presidential bid and touches on many of the themes he continues to hammer on the stump. Returning again and again to the of concept of "liberty," he hails the virtues of the gold standard, attacks the Federal Reserve and defends the rights of gun-owners. But the book, re-issued in 2007 during Paul's last presidential bid with a cover photograph of an ominous SWAT Team, has so far escaped scrutiny amid the latest furor over his newsletters. In one section of the book, Paul criticized people suffering from AIDS or other contagious diseases for demanding health insurance coverage. "The individual suffering from AIDS certainly is a victim - frequently a victim of his own lifestyle - but this same individual victimizes innocent citizens by forcing them to pay for his care," Paul wrote. In another chapter on the rights of individuals outside of government – the central theme of Paul's libertarian philosophy - he sharply criticized the "absurdity" of politicians who try to bestow differing rights on various social and ethnic groups. It's dangerous to craft a separate set of rights for groups like Hispanics, African-Americans, children, employees and the homeless, Paul wrote. "Until all these terms are dropped and we recognize that only an individual has rights the solution to the mess in which we find ourselves will not be found," Paul explained. "Every year new groups organize to demand their 'rights,'" he continued. "White people who organize and expect the same attention as other groups are quickly and viciously condemned as dangerous bigots. Hispanic, black, and Jewish caucuses can exist in the U.S. Congress, but not a white caucus, demonstrating the absurdity of this approach for achieving rights for everyone." Paul also defended the rights of an individual to "control property and run his or her business as he or she chooses," without interference from "the social do-gooder." In a passage first flagged by the Houston Chronicle in 2007, Paul then claimed that sexual harassment should not be a violation of one's employment rights. "Employee rights are said to be valid when employers pressure employees into sexual activity," Paul wrote. "Why don't they quit once the so-called harassment starts? Obviously the morals of the harasser cannot be defended, but how can the harassee escape some responsibility for the problem? Seeking protection under civil rights legislation is hardly acceptable." Paul's campaign manager Jesse Benton defended the book and said the candidate "has been speaking out for decades that rights do not come from belonging to a group." Wow, I like what he's saying and no matter how you try to spin it as racist, those statements have truth and are not racist. I've listened to the man and I really like what I hear. Regarding people with AIDS or other contagious diseases: "but this same individual victimizes innocent citizens by forcing them to pay for his care," Paul wrote." Here's my biggest problem with Paul: He does not believe in community. It's every person for themselves. His view is utterly lacking in compassion or any sense of connection to others. "Ive got mine; screw you" should be his campaign slogan. Oh, he and his Ron-bots like to dress this up as "individual freedom," but it sounds more like a sociopath to me. Man, CNN is really looking desperate. They do not understand that Ron Paul gains support...he does not lose it. They said his support ceiling was 12% a while back, now they say his support ceiling is 24%. What a bunch of garbage. Dr. Paul has the establishment running scared. They want Mitt Romney to win because the know Obama can easily defeat him considering his own staff helped shape Obamacare. Does anyone else find it weird that CNN is being so nice to Romney? Come on people. This is no surprise at all. And, Rand Paul holds much or most of the same views as his father. Both should be run out of town on a rail! So now what...........................yet another racist from Texass..............................WOW what a surprise. What Ron Paul fails to realize is that these are not "special rights;" they are laws to guarantee that these groups have the same legal rights as everyone else. And these laws wouldn't be needed if these groups WERE treated equally; but they haven't been. Ron Paul and his ilk are incredibly self-centered and naive. That alone should be enough to make someone not vote for him. You need to take responsibly for your immune system to keep it strong. There is much research on this. If you are catching every virus that comes into the classroom, your immune system is stressed! Do some research and take some responsibility for your health. No doctor can cure a virus anyway. Paul is very sympathetic personally but he understands that the Federal Government cannot be mommy and daddy to everyone, it is just too expensive and not effective. @PJ: "Romney's expensive machine is at it again. He wont stop until all the dirt comes out on any of his opponents." Ron Paul published this book under his own name; how is that "dirt"? And if you're such a believer in freedom of speech and the press, then why do you have a problem with the contents of this book coming to light? Lastly, you're assuming Romney's camp put this out there; it could have been anyone – including anyone with enough brains to understand just how dangerous Ron Paul's views are. He didn't say people should be judged by the content of their character, did he? Because that would be over the line! Seattle Sue please read a little more about Ron Paul. He one of the very few that does not participate in the congressional retirement plan. 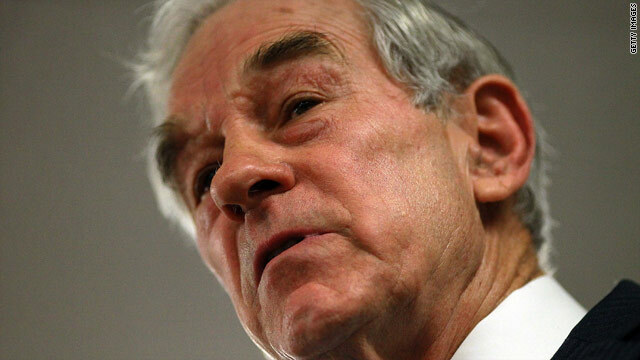 Ron Paul also wants to end the federal war on drugs because for one thing is is very biased against minorites. That is not what I would call a racist stance. @Dorel Gilad: By your reasoning, I shouldn't have to pay for any illnesses brought on by YOUR lifestyle, including your decision to not off yourself before you start costing society money. The satement about the worker just leaving if they are being harassed needs to be looked at a little more closely. In a true free market system, if you have a boss who is harassing employees and every employee keeps leaving, then pretty soon, no one is going to be working for that person and they will be out of work. But here is the thing, in Dr Pauls ideal world, there will be plenty of jobs to go around, in fact, workers will be in such high demand, anyone who doesn't treat their employees like gold will be without them. So you have to understand where he is coming from when he makes these statements. It's like the school bully. If he picks on you and you go and run tot he teacher, he knows he has you and him getting detention is a reward, so it encourages his behavior. If you ignore him or punch him in the nose, he is going to back down and try to find another target, if his whole class turns on him, he is going to be forced to grow as a person and the whole system gains another productive member. So instead of a helpless victim and a boorish bully, you have two people who may respect eachother. People need to stop feeling so small and insignificant, you are in MY Universe, either treat me with respect or GTFO. He's an odd old man. He has some good policies...and he has some completely unrealistic ones. I agree with his argument on individual rights IF this were some sort of happy hand holding nation where we all sing campfire songs. The fact is that it isn't. It would make sense if we all started out at the exact same level of rights and benefits but when it comes down to it, we don't. There must be a way for people to correct injustices and binding together to do that just makes sense. I've changed my mind. I think we should be exposed more to Dr Quack and his policies. Go Paul-bots. Let's see what this man really stands for. Paul preaches individual liberties which are based on nonviolence and tolerance. But it seems that truth doesn't matter in this blog. The man is right! Many minority people take a good deed that was meant to give them a helping hand and turned it into a lifetime of laziness. This has backfired on this country and will have to stop one day -– A lesson learned for the country. Individuals, in the end, have to be responsible for their own lives -- not a government subsistence called welfare.